The Next store in Oldbury has a common problem where the store doesnt have a Google 360 tour known as Business View so instead Google use the “See Outside” function which is generated from the vehicles photography. If the pin location is slightly wrong it will show the wrong business and this is a huge negative as your business is then advertising another company within the Google system. 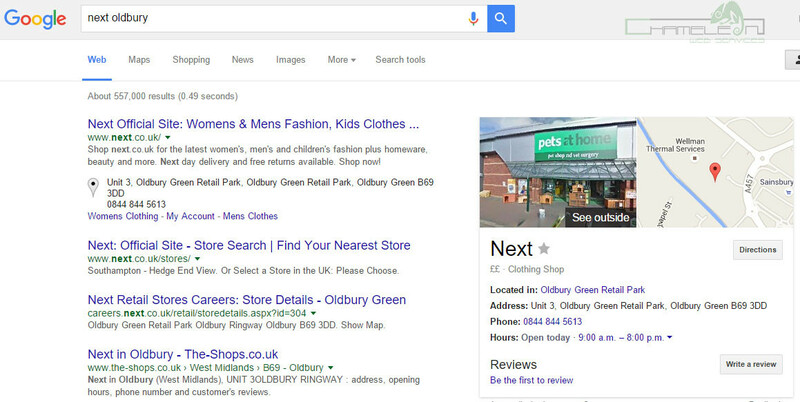 For example is you look at the search for “Next Oldbury” you will see “Pets at Home Oldbury” instead. This is an easy fix for Chameleon and we can simply access the Google Pin data for a company and make changes as required. We looked and most of the high street brand names had similar issues. Chameleon Web Services is an official Google Partner for bringing Google Street View Inside a Business and if your business needs help on Google Maps then call the Head Office on 0121 663 0456. If you click “See inside” you get a 360 virtual tour allowing you visit the business online.